Opis: Mapping Mars from orbit, instruments on the Mars Global Surveyor (MGS) spacecraft have recently revealed banded magnetic field patterns - a startling and unanticipated suggestion that the Red Planet was more Earth-like in its distant past. The red and blue regions within the MGS orbital tracks across this portion of southern Mars indicate adjacent areas of crust where magnetic fields point in opposite directions. The bands seem to run east-west and are about 100 miles wide and 600 miles long. Such patterns are known to be produced on Earth by plate tectonics. As the crustal plates spread apart along the mid-ocean ridges, they carry a progressive banded record of Earth's changing magnetic field. The similar patterns on Mars are seen as evidence that it too once had moving crustal plates and a changing magnetic field, although both processes - still active on the larger planet Earth - are thought to have long since died away. 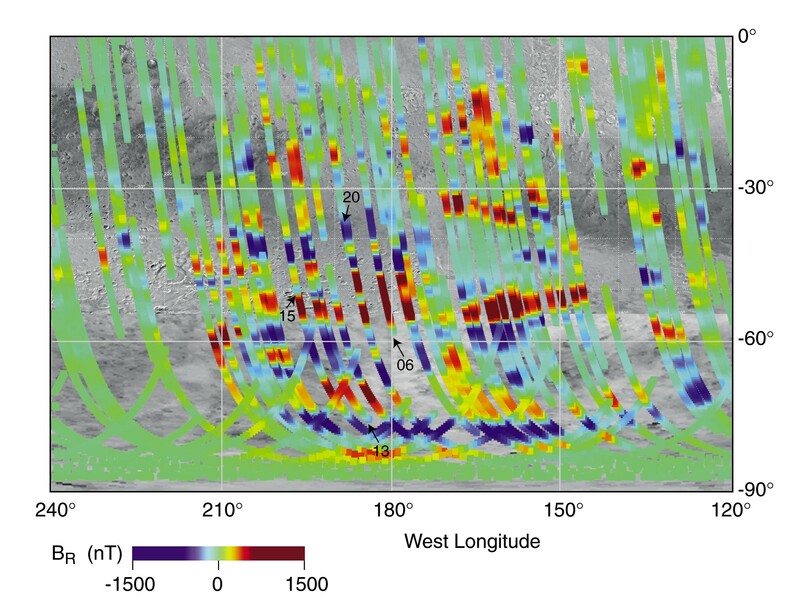 These high resolution measurements of martian magnetism were made possible by the revised, close aerobraking orbits of the MGS spacecraft and not originally planned.